PHOENIX (January 14, 2012) – A huge crowd of 49,236 fans filled Chase Field on Saturday night for the second race of the 2012 Monster Energy AMA Supercross, an FIM World Championship, season. In just two races together, the new relationship between Ryan Dungey, of Belle Plaine, Minn., and Red Bull KTM has proven to be fruitful as the former champion captured his first win of the season, and KTM’s first Supercross Class victory ever, with a dominant wire-to-wire effort. In the Western Regional Supercross Lites Class, Monster Energy/Pro Circuit/Kawasaki’s Dean Wilson, of Menifee, Calif., prevailed with a similarly-convincing performance. Dungey capitalized on a good start out of the gate in the 20-lap Supercross Class Main Event to grab the Nuclear Cowboyz® Holeshot and checked out on the field. Behind him, Toyota/Yamaha/JGRMX’s Davi Millsaps, of Murrieta, Calif., and Monster Energy Kawasaki’s Ryan Villopoto, of Poulsbo, Wash., assumed their spots at the front of the field, with both TwoTwo Motorsports/Bel-Ray Honda’s Chad Reed, of Dade City, Fla., and Toyota/Muscle Milk/JGRMX’s James Stewart, of Haines City, Fla., mired in the field following mid-pack starts. The wild action of the night began when Millsaps went down in the track’s sand section on the opening lap, collecting Villopoto and relegating both riders to the tail end of the field. Villopoto’s misfortune allowed both Reed and Stewart to move forward, crossing the line 8th and 13th, respectively. From there, Reed, Stewart, and Villopoto began climbing their way through the field, with Reed and Stewart doing so together. Just as Stewart made his way past Reed in his continued forward progression, he went down in the same section as Villopoto on Lap 7, falling outside the top 10. 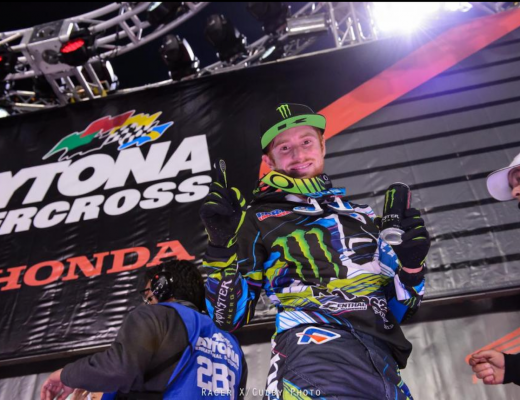 Villopoto eventually made his way around Reed and set his sights on the top five, slowly picking his way through the field and bringing the crowd to its feet. In the end, Dungey took the checkers by over six seconds for his second Supercross Class win in Phoenix. Monster Energy Kawasaki’s Jake Weimer, of Rupert, Idaho, finished second for his first career Supercross Class podium, while Villopoto passed most of the field and fought his way into third to salvage his points lead. Reed brought home a fifth-place finish, while Stewart soldiered on to finish eighth. Dungey and Villopoto currently have a share of the points lead, and both will adorn their bikes with the red number plate next weekend, signifying the current rider in control of the championship. 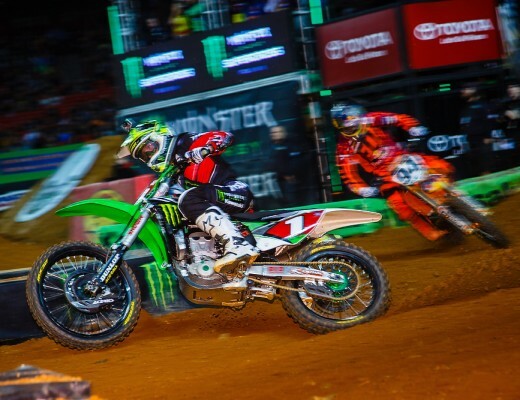 In the Supercross Lites Class, Monster Energy/Pro Circuit/Kawasaki’s Tyla Rattray, of Wildomar, Calif., captured the Nuclear Cowboyz® Holeshot, but Wilson worked his way into the lead on the exit of the second corner. Once out front, Wilson continued to pull away from his competitors and rebound from a sixth-place effort one week ago. Red Bull KTM’s Marvin Musquin, of Murrieta, Calif., garnered his first career Monster Energy Supercross podium in second, while Rattray held on for third, moving into the Western Regional Supercross Lites Class championship points lead. 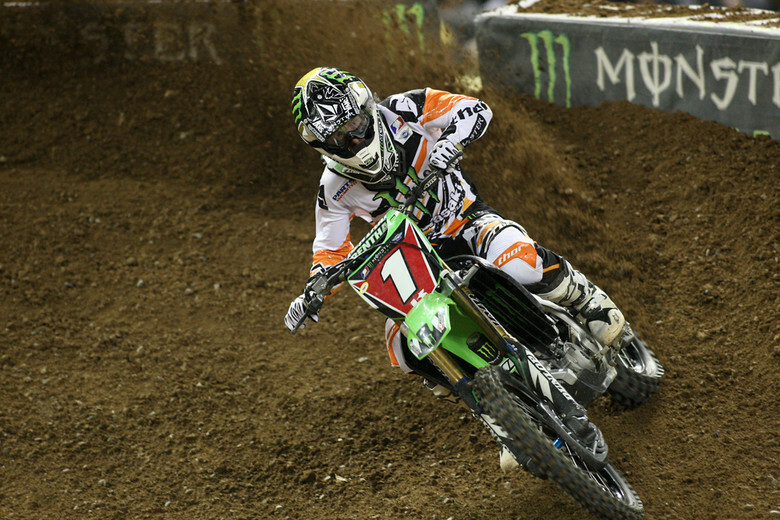 The 2012 Monster Energy Supercross season continues next Saturday, January 21, from Los Angeles, with the third race of the season inside Dodger Stadium. The festivities begin at 7 p.m. PT.